Italjet Formula AC ( Formula with the standard 50cc Morini engine), italjet Formula LC (Italjet with Franco Morini Liquid Cooled 50cc engine), Malaguti Crosser, TGB 303RS, TGB 303R, TGB 203, any 50cc TGB with the standard air cooled Franco Morini 50cc engine. Known for its superb quality TK Exhausts and Replacement Mufflers are made in the South of Spain in Beniajan a region of Murcia. TK develops new and exciting exhaust systems based on constant research on professional dyno benches, and based on the race results obtained in the most demanding competitions. The South of Spain is known for scooter parts and scooter racing and it is in this environment that new and creative ideas come out for many of the hydro-formed, robotic lazer, and hand crafted exhaust systems. The factory is an OEM supplier to many well known scooter and motorcycle European OEM manufacturers. The TK Exhaust racing series is held in high regard with benchmark results on the same level as top tier brands Akrapovic, LeoVince, Two Brothers and Tecnigas. The TK factory counts on some of the larger installations dedicated to the research, development and manufacture of exhaust systems for scooters, mopeds, maxi-scooters, quads, UTVs, and motorcycles for both two stroke and four stroke engines. The research and use of top quality materials allows TK to offer exclusive high-end high-performance racing technology products, both for professional competition and for urban and leisure use. All TK exhausts comply with current regulations and approvals. However, due to their racing nature they are sold as off-road competition only upgrades and are labeled as such in the USA. 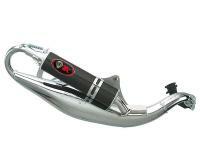 Racing Planet carries the full line of TK Exhaust system. Search under Turbo Kit for a full list of scooter muffler upgrades.